Thousands of people visit the SDWS gallery each year. On the First Friday of each month, The San Diego Watercolor Society hosts a reception to present the month's new exhibition. From as many as 300 pieces entered, the juror selects the top 100 for exhibition and sale. 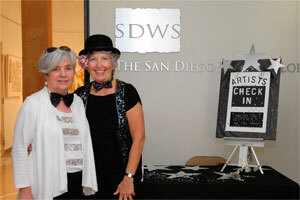 Each year SDWS hosts a gala event to celebrate the annual International Exhibition. The specifics of this annual event are published in conjunction with other exhibition related events.